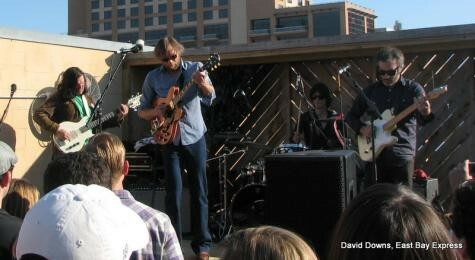 Two-dollar pints of Dos Equis and ample sunshine on the rooftop of a bar named Cheers accompanied the short but refreshing set from San Francisco classic rockers The Mother Hips. The grizzled, blue-collar four-piece traverses territory commonly ceded to the Rolling Stones, Dire Straits, and Tom Petty, yet the band remains untouchable. With twenty years under their belt and about a dozen studio and live albums, the most recent being 2009’s Pacific Dust, the Hips are veterans of American music, masters of meting out bluesy, rootsy, Southern rock-inspired diddies like “Magazine.” Tim Bluhm's solos are so confident while fellow guitarist vocalist Greg Loiacono and bassist Paul Hoaglin seem like stoic hardliners, laying down interlocking grooves. Drummer John Hofer is a straightaway old-school basher. 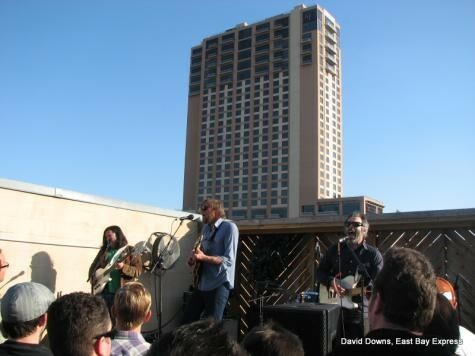 Full of die-hard fans, the free show on the small rooftop of a dingy shot bar represents the best of Austin: no covers, no lines, sunny skies, and some rock. Their show in Big Sur at the end of April seems like their most natural element.